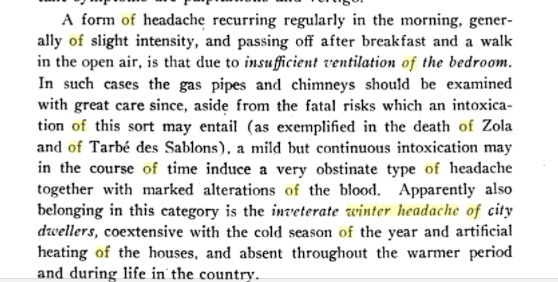 Winter has always been carbon monoxide season, so much so that a 1922 book coined the term “winter headache” for what was undoubtedly carbon monoxide poisoning. Martinet, Alfred, Clinical Diagnosis, Case Examination and the Analysis of Symptoms. Sometime in this period of late fall, the furnace will have kicked on for the first time. Often times it is early in the heating system that the worst poisonings occur. As with a car that hasn’t been driven for a while, the start up may put stress on parts that have not been used in months. A thorough seasonal checkup of the HVAC system is always recommended, even for single family homes. In a commercial establishment or a public school, it is the standard of care to have it done by a professional HVAC firm. With the setting back of the clocks and the end of Daylight Savings Time, it is time to check the batteries in all detectors, both smoke and carbon monoxide. Even those detectors which are hardwired into the house need to have batteries changed every six months. But it is also important to know that chronic carbon monoxide exposure can still occur during the carbon monoxide season, even if the standard carbon monoxide detectors are working properly. Those detectors are not sensitive enough to mid-level concentrations of carbon monoxide, especially if the leak is occurring day after day. UL 2034, the standard which carbon monoxide detectors are required to alarm, is designed to warn of eminent danger situations, not avoid concentrations where the COHb level may get to be as high as 10%. A level of carbon monoxide in ambient air could be 149 ppm for 3 hours and 59 minutes before the alarm went off. That is a way too much carbon monoxide and if it was happening day after day, we would predict nearly a 75% chance of disability. The analogy would be the difference between a single sport concussion and the lifetime of hits that a football player suffers, leading to CTE. We recommend that people purchase CO alarms that register levels as low as 10 ppm, immediately.